Is another exchange going to bite the dust? DragonEx, a Singaporean platform, appears to have been the victim of a hack, with the full reach of the consequences still being unknown. The case might remember those of QuadrigaCX and Cryptopia. According to a message shared on an instant messaging platform by the DragonEx Team, their “users’ crypto assets and platform crypto assets were transferred and stolen”. The confusing explanation goes on to say that “part of the assets were retrieved back, and we will do our best to retrieve back the rest of stolen assets”. Other details shared with the affected members of the exchange included the noticing of Estonian, Thai, Singaporean and Hong Kong authorities about the hack. However, a key point, the total amount of funds stolen, has not been shared in so far. 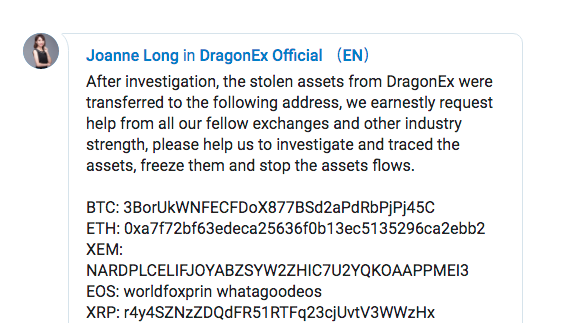 According to an update published today, a representative from DragonEx shared several addresses where she claimed the stolen assets had been transferred, while requesting for help from other exchanges and industry members in order to investigate and trace the assets. Do you think that the funds stolen from DragonEx will be recovered?